I absolutely love the opportunities that social media can provide us. A mere twenty years ago, it would have been a rare occurrence to connect with anyone internally at a major company. With social, communication lines are more engaging, and often times more human, than ever before. Nothing could be more evident than my experience at SXSW last week. This is what free swag can look like! My girlfriend and I were waiting in line for a Fader Fort show, presented by Converse. She was very excited to catch Solange Knowles (very talented younger sister of Beyonce, who put on a great show). I biked to meet her directly after I got off work, and we joined the forever long line after picking up wristbands. As is my standard, I checked in to the venue. Upon checking in on Foursquare, I was provided with the information of a sponsored hashtag for the event that would allow me the possibility to win some swag. As we social media nerds do, I immediately tweeted using the hashtag to announce my presence at the event, expecting nothing more than perhaps a retweet later or a thanks for enjoying the event. What happened next made my entire week. 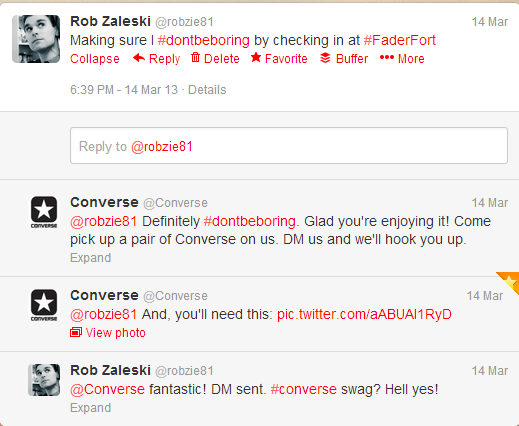 Not only did Converse tweet me, they offered me a free pair of Converse shoes. I’m not one who wins things often, so this alone made me geek out. I was instructed to DM them with information so they could provide me a contact. This is where thing reached the level of super awesome. I was given a number to text message, allowing me to find the person who would get me free shoes after we got in. I did, however, I noted that we were in a line that was moving at the pace a snail could have easily topped. How it all went down. Rather than giving me a blase “Well, we hope to see you if and when you get in,” Converse obliterated my expectations. They told me to get out of line and meet a guy at the entrance. They were going to let us in, simply because I tweeted their hashtag. There was a strong possibility that we were going to miss Solange’s performance (see a clip below) with the look of the line, and an increasing number of badge holders showing up, but we were able to get in, get settled on a spot, and enjoy her whole performance. My girlfriend was thrilled with the show, and I was thrilled that I got some new kicks. All this thanks to the direct line of communication that social media provides. Guess who could be labeled a brand advocate for Converse now―this kid. 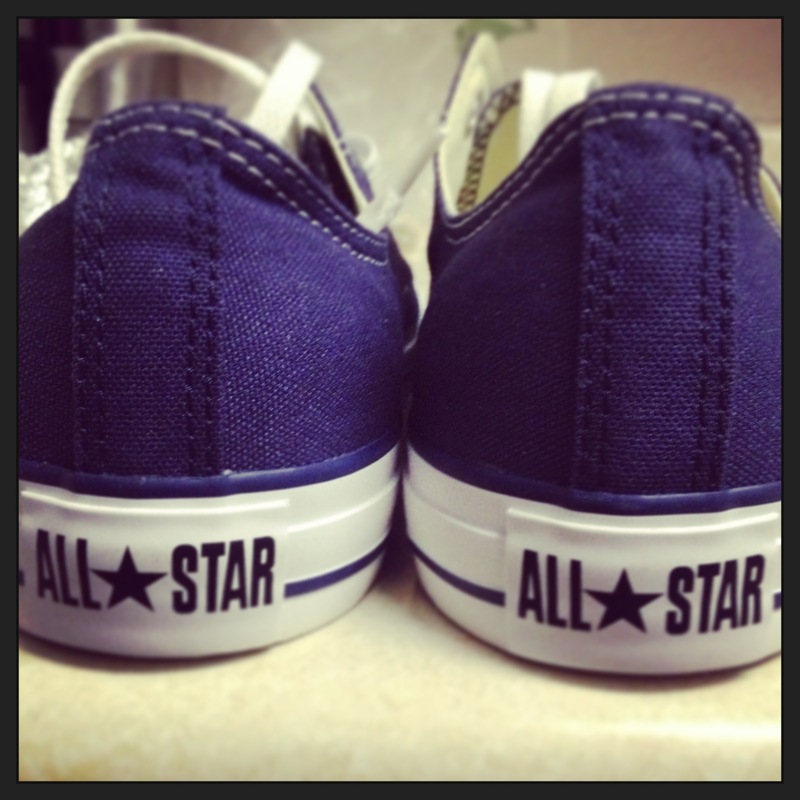 Way to go Converse. Have you had a similar experience, whether at SXSW or otherwise? 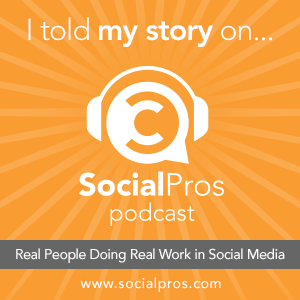 What kind of awesome interactions have you had with a brand via social media? Share your story in the comments below!